Real estate or property. It is the primary (and indeed one of the only) assets whose values do not depreciate over time. Depending on the particular title, ownership of land may include mineral rights to any geophysical aspects occurring thereon. Ownership of land does not automatically include the right to develop it, depending on local regulations. While supply of land does not vary, demand may change greatly depending on its particular features, number of people in the area, and cultural differences regarding land ownership. It is an attractive form of collateral because it cannot be stolen or destroyed. See also: Plot, zoning law. A firm's dollar investment in real estate. 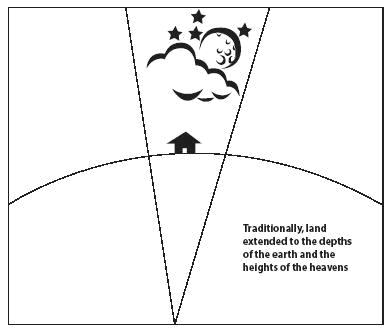 In the law,the surface of the earth,descending down in a cone shape to the center of the world and upward to the heavens, along with all natural things thereon, such as minerals, water, vegetation, and rights to the air.This is less than the concept of real property,which includes land but also all rights in and to land or its use, and all artificial things attached to the land.